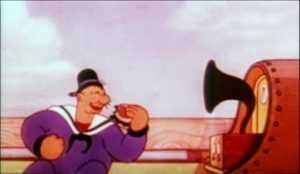 When J. Wellington Wimpy first voiced that phrase on December 28, 1934 in Fleischer Studios short “We Aim to Please,” Popeye’s 17th theatrical cartoon, [http://popeye.wikia.com/wiki/We_Aim_to_Please] the White Castle hamburger chain had already been around for 13 years. By the time E.C. Segar added the character of Wimpy to his King Features Syndicate cartoon Thimble Theatre in 1931, White Castle was well on its way to selling 50 million hamburgers. It would achieve that mark in 1941.